A year ago at this time I did another Post about this annual event, Me Hosting Dinner Club. I did a blog about it and you can go back and see that post here: Just type in the search bar:my turn to host dinner club, a vision in pink, my old historic house. I am a very lucky guy to belong to this elite group. All the other members except me, are from the next town up the road, Louisiana,Mo. It is about 9 miles up the river. Most of the people in this wonderful group are couples. The thing they all have in common is that they all live with in a few blocks, on a hill in Louisiana. We often call them," The Hill Group." One single lady in the group and I are friends. We have antiques in common, as she and I both have shops,aka, small antique malls. I guess I was paired up with Ms. Nancy and that is how I made it into this wonderful group. Last Years Birthday Party, A Vision in Pink. Almost every month we meet to celebrate who ever has a birthday that month. Most often than not, we meet at the home of my friends, Judy and Carl. They are the most generous people I know and they have a very large dining room. Judy loves to cook and she has an amazing collection of table pieces. 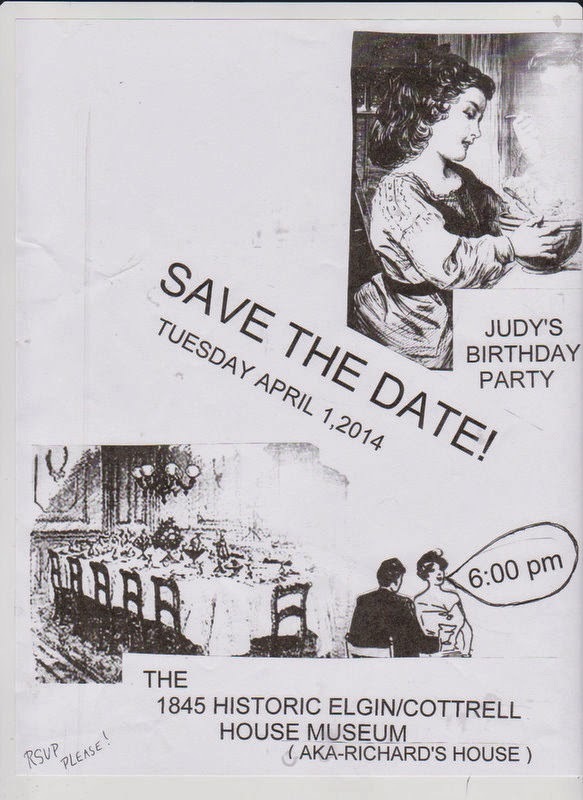 Once in awhile we go out to eat at a local eatery.Well April is Ms. Judy's Birthday and I did not want her to have to host her own party, so I am stepping up to the plate and having the party at my house.Usually the Host makes the main course and every one else brings a dish. We always have way to much food and it is always amazing. It gets harder, year after year, to come up with something to serve. We have had lots of ham, chicken, and pork chops. I know it is not really a dinner dish, maybe unheard of as a main course for a formal dinner, but I am having Quiche. I am having 5 flavors. Cutting them into small servings and letting people choice a couple. I am having sausage,ham and tomato, spinach and bacon, aspargus and bacon and cheese burger.I am also making the Birthday Cake, Chocolate Rum with strawberries and whip cream. My guest are bringing, home made bread and jelly, jello fruit salad, green salad and fried apples. Doesn't it all sound good?? Each time I set a formal table, I dig out Emily Post Book on Proper Table Settings. A few weeks back I sent out, "Save the Date Cards", so everyone would be able to attend. Us usual with my working full time, I have to do things in stages. 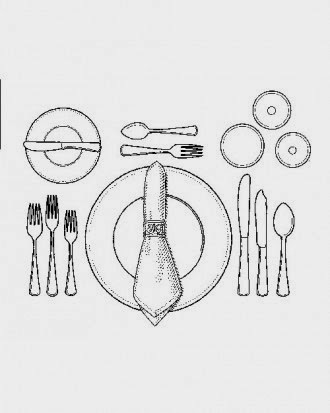 I take several days to set the table. I fist come up with a plan and go from there. The table has to be opened and a couple of leaves added. This is not an easy or pretty sight. I end up doing it in the middle of the night and there is no one to help. It involves me getting on the floor under it and bushing it open with my two arms and two legs. Can't you just picture that. After the leaves are in, I have to gently ram the end of the table into a wall ,to shut it tight. Next there is a table cloth to iron. I got rid of the ironing board many years ago, so I iron the cloth after it is on the table. One has to be careful with the hot iron on the table top. While the iron is out I iron the napkins. I do this with a cutting board, covered in a t towel , on my lap, in front of TV. Mix and Match Oriental China. There is 4 plates like this. And four plates like this. The 12 napkin rings all match. like this one. Does any one use napkin rings any more? There are 12 of these small plates. They can be used for salad, bread and butter or desert. At this party we will use them for home made breads. Fake Forsythia made by hot glue gunning silk forsythia blooms onto real tree branches. forsythia work. I had done this once before with cherry blossom for a parade float. Use real bear tree limbs and hot glue the blossoms on at random. It worked then, so I thought it would work now. The next problem was where to find a fake forsythia? One has to realize that I live in the middle of no where. Well the solution was to call my friend Donna, she always everything in her craft room. Sure enough, she had a big fake bush just full of yellow forsythia blooms. We made a deal and off I went to cut some tree limbs. Not hard to find here as there is not even a tree leave bud in sight, guess why, was 19 degrees yesterday morning! I cut them off and got the old gun gun heated up. After only one burn, they were done. I arranged them in cut class vases. I think they look good, some one has already said, where did you find forsythia blooming already? Yeah, it works. My over all plan is to add the yellow tulips and hopefully some jonquils before the party date of April 1st. If all else fails, I might pick the jonquils and try and force them open with warm water and warmth.My table theme is," A walk in the Forsythia." The rest of my centerpiece consists of several of my French and German bisque figures. My ideal was a effect that the figures were taking a walk on a spring day, in a garden, full of blooming forsythia. I have also added several votive candles in pale green and yellow. When the chandelier is dimmed and the candles are aglow, it should make for a magical table. Last year I used my Rose Mead China, it went along with the dinner theme, "A Vision In Pink." The china features large pink cabbage roses. This year I wanted to use something else, so I choose my Oriental Mix and Match China set. I purchased this at Nieman Marcus many, many years ago. There were lots of patterns and pieces to pick from. I ended up with these, buying a few at a time over a period of a couple of years. They set a really pretty and colorful table.Since the china was mix and match, I did the same with the water glasses. I have a collection of color water goblets. They live in the kitchen window, on shelves, were the light can come through. I chose all blue ones for this party and the patterns are mix and matched. I seem to be breaking lots of rules with this party. Fake flowers, mix and match china and crystal and Quiche for the main dinner course. Don't tell Emily Post. She's not invited anyhow! This is it so far, will more make it in time? Here's how they look out in the garden.